In this distant land, my soul shall thirst and my tongue shall praise, Jesus, my Lord and Savior King, who from the dead was raised! And we His chosen people shall sing, with songs that never cease, And tell, of His unending love, His comfort, and His gift of peace! Looking back, we’ve come a long way. A long way from our homes in the tropical south of India; and a long way, when considering our journey as a church in the State of Kuwait. Following is a humble attempt at recording some significant milestones of our journey; something that we can look back at, for all times. Some time back, a team of visionaries of Kuwait Mar Thoma Parish brought forward a proposal for a new independent parish, as it was an indispensable need of the time. A group of 33 members - with the prayerful support of a good number of enthusiastic Marthomites - chartered out an action plan under the invaluable guidance of The Mumbai Diocesan Bishop Rt. Rev. Joseph Mar Barnabas Episcopa. A meeting was chaired by His Grace on March 22nd 2007 at the I C S K Auditorium, Salmiya to further develop this initiative. Never-ending and amazing grace of God Almighty that worked through NECK authorities and through the authorities of Greek Catholic Church at Salwa helped us achieve the essential requirements of time and place for our weekly worship and Holy Communion services. Consequently, with the permission of the Synod, and order (Kalpana) of the Marthoma Metropolitan, St Thomas Mar Thoma Parish, Kuwait came into existence on Tuesday 10th April 2007 to improve fellowship among the members and for better service to the people in need. The inaugural Holy Communion was celebrated by Rt. Rev. Joseph Mar Barnabas the Diocesan Episcopa on 10th April 2007 at 7.30 P M at the Hall of Peace in NECK; assisted by Rev. P. M. Varghese and Rev. Joseph K. George, Vicar and Asst. 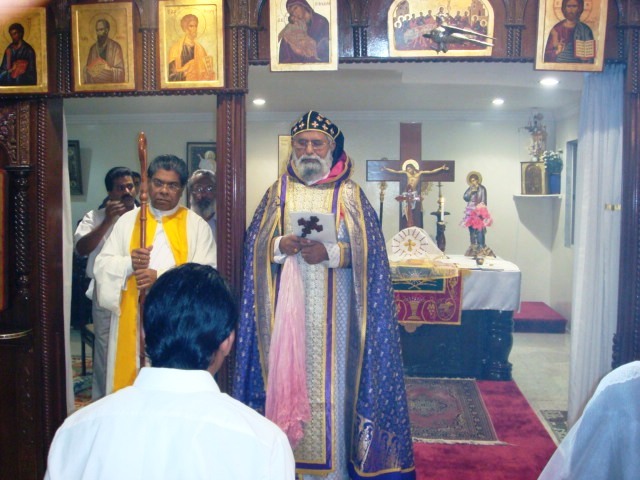 Vicar of Kuwait Mar Thoma Parish. Immediately after the Holy Communion service, an inaugural meeting was held in the Hall of Peace, formation of the new Parish was declared by the Diocesan Episcopa Rt. Rev. Joseph Mar Barnabas in the presence of Rev. Amanuel B. Ghareeb, President of NECK Common Council and the Mar Thoma community in Kuwait. We are thankful to the Almighty for His grace in fulfilling this long cherished dream of the members for a new Parish. Consecration of St. Thomas Centre as a place of worship - which is the first one of its kind in Kuwait - by Rt. Rev. Dr. Abraham Mar Paulose Thirumeni on 05th March 2010 was another important milestone in the faith journey of our Parish. St Thomas Mar Thoma Parish, Kuwait ascended to greater heights under the meticulous leadership of distinguished Achens of the Marthoma Church. Rev. Sunny Thomas as our first vicar led us from May 2007 to April 2010; followed by Rev. Thomas Koshy Panachamootil from May 2010 to April 2013, and Rev. Sunil Joy from October 2013 to April 2016. At present an eminent scholar and great shepherd in Christ, Rev. Bobby Mathew is leading us as our Vicar. Achen’s Baskiomo Ani Kochamma, and children Abhishek, and daughter Ananya support Achen in fulfilling his responsibilities. Organizations of the parish - Edavaka Mission, Yuvajana Sakhyam, Sevika Sanghom, Parish Choir and Sunday School - existed from the beginning of the parish and are functioning in a full-fledged manner supporting the parish in its ministry. St. Thomas Mar Thoma Parish cherishes the many accolades awarded to its members: Sevika Sanghom members winning at many competitions at center and diocesan level, a younger member winning at Yuvajana Sakhyam Kendra Kalamela, and our Sunday School students winning different prizes are decorating the crown of this parish with golden feathers. Members of this parish are cheerful yet humbled to say that they received the award of ‘Best Parish’ in the Delhi Diocese for the year 2013/14. 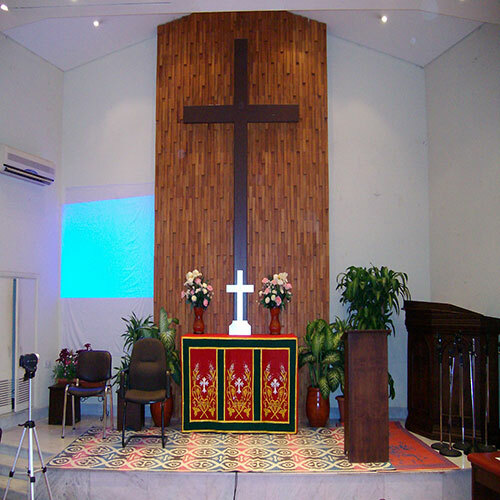 St. Thomas Parish’s substantial role in the activities of the Episcopal churches in Kuwait too is worth a mention. Presently we have 1187 members from 389 units out of which 319 are families and 70 are single members. Around 240 members obtained transfer from Kuwait Parish and in the very first year our parish could locate many Marthomites without membership of any parish in Kuwait and extend the Christian fellowship to them. We continue to serve humanity in Kuwait, India, and other parts of the world. +965-25635253 info@st-thomasmtckuwait.com www.st-thomasmtckuwait.com Parsonage Flat 14, 1st Floor, Building 20, Street 10, Block 10 Salmiya Hawalli 13116 Kuwait.